I help moms create space for themselves so they can navigate family transitions such as divorce, grief, and adolescence as opportunities for growth and connection. 6. Okay. In terms of clarity this is a solid 8/10 but in terms of workability it’s 2/10. I get what you’re talking about and I find myself wondering if moms would actually pay for this. This article speaks to why. What you’re offering, it seems, is to help them make sure they’ve got bandwidth to deal with life’s inevitabilities when they show up. Which is beautiful. But it’s not something that people tend to spend money on. On the other hand, if you’re suggesting that you work with mothers once they’re already in the midst of the transition . . . that’s a different story. Once she’s in a divorce then suddenly she might be very open to what you’re offering. It seems like your core point of view is that these moms, more than anything, need space to deal with these transitions. I feel the exact same way about entrepreneurs in crisis and creating space is the first two weeks of my program The Meantime. But I don’t frame it as being about creating space but cashflow. In niching, we want to be very cautious about basing our niche on what we think people need. Better still to sell them something they want and then give them what they really need within that. Educate them in the process. Another great example of that is here. 7/10: I don’t quite get you mean about “creating space.” It’s a term that’s used often but is a little ambiguous. Do you mean they create more physical space for themselves to retreat and regroup (as suggested by the illustration) or is it more time that they carve out for themselves to keep themselves centered? Also, I would jump right in with, “I help moms navigate family transitions such as divorce, grief and adolescence . . .” because I can identify myself as your client more quickly. 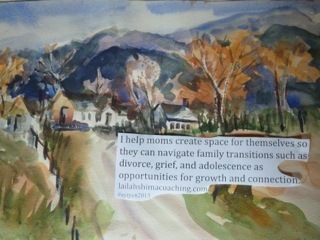 7/10: It could use a stronger connection from the creating space through to the navigating transitions – what happens for the moms? Yes, and as a mom I need this too. Love that, navigating adolescence; I am in that niche now, with two more coming down the line. I honor you and your work. 7/10: Every time I start making a list of three, I try to ask myself if I’m narrowing down or adding in new details. In this case, you seem to be broadening your field rather than niching down. “Moms” is a pretty big group, too, since everyone has one. Thanks so much for all the gritty feedback. I’m totally new to this, so am soaking it up. I see where I wasn’t clear, because I absolutely am not talking about preventative maintenance. I work with moms grappling with gritty realities. So you’ve helped me see where I didn’t articulate that, and how I can do so more effectively.